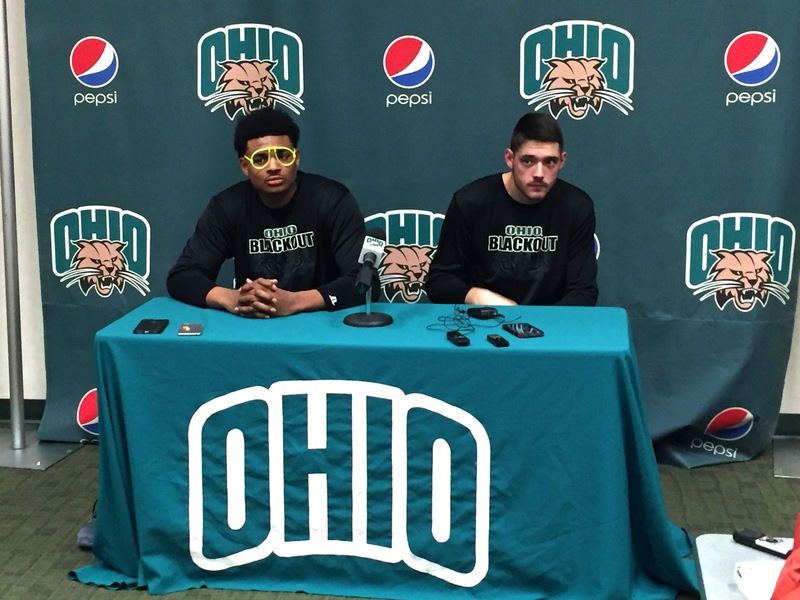 Tony Campbell (left) dons glow stick glasses in the postgame press conference after his 28 points led Ohio to victory over Kent State. Ohio forward Tony Campbell scored 22 points in the second half after just six in the first to lead his team to its 13th win of the season. He said the secret was in his soles. Whether it was his footwear or not, the junior forward upgraded his play in the second half to lead Ohio (13-7, 4-4 MAC) to a 72-61 victory over the MAC-leading Kent State Golden Flashes. Campbell’s 28-point, seven-rebound performance led all scorers. Most of Campbell’s work came against another standout MAC big man, Jimmy Hall Jr. Hall countered Campbell’s big day with a double-double of 23 points and 13 rebounds. Ohio made over half of its shots in the second half after making 34 percent of its attempts in the first half. The Bobcats got it done in the second half with great ball movement. Jaaron Simmons finished with eight assists and Jordan Dartis totaled six. Dartis played well when he was asked to switch from shooting guard to point guard when Simmons got in foul trouble in the first half. Kenny Kaminski added 12 in the Ohio’s winning effort. Treg Setty tallied nine points, seven of which came in a personal 7-0 run with six minutes remaining in the game. Kent State’s Deon Edwin recorded 11 points and four rebounds. The Golden Flashes spent most of the game without senior guard Xavier Pollard. Pollard left the game early in the first half with a lower body injury. The game was televised on ESPNU and Phillips thinks that made his team perhaps too eager to get on the floor. Friday’s victory is the first of three home games for the Bobcats. Ohio returns to the court on Tuesday to host Akron (17-4, 6-2). The Zips benefitted from the ‘Cats victory by moving into a tie with Kent State for the MAC East’s top spot.